TheFireStore likes to help make Christmas shopping as easy as can be on you. The talented people in our web department have made a really simple, easily navigable way for you to do your holiday shopping without missing a beat! 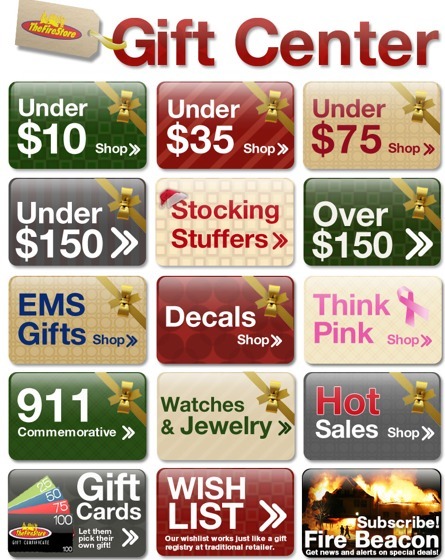 When you simply log into TheFireStore.com, just click on the very top, left link entitled ***gift center*** and you will see this image with clickable buttons that go directly to all sorts of great categories to help you get your shopping rolling, according to budget and all! Looking for gifts for under $10? Right here is a good place to start. What about those big, special, higher ticketed items? How about our over $150 section? What about that breast cancer survivor in your life? Gifts for her, right here. Looking for stocking stuffers for the firefighter in your life? We got you covered. So if you're ever struggling on where to start in selecting that perfect gift, our Gift Center is the place!